Naysmith celebrated his men ending their seven-game losing streak in the Championship as they held on for three precious points thanks to Stephen Dobbie’s second-half penalty and Lyndon Dykes’ 58th minute strike, before Nicky Clark’s 71st minute header made them cling on for victory against Robbie Neilson’s hosts who missed the chance to go top of the Championship. Queens were forced to survive more than five minutes of added-on time by referee Alan Muir, before finally ending their recent run of bad form in their quest to climb clear of the relegation zone. But Naysmith revealed how he had to suffer through a lack of communication from tight-lipped officials who refused to put him out of his misery by informing him of how long was left. “It was a complete nightmare,” Naysmith said. “My frustration comes from the fact the assistant referee was standing right in front of me and I asked him, but got no answer. “I couldn’t get an official to tell me how long there was left. I didn’t even see a board up saying as much. United should have taken the lead in the 13th minute. Sam Stanton set free Paul McMullan whose low shot was parried by visiting keeper Jack Leighfield. As the rebound fell to Pavol Safranko, the Slovakian striker could only shoot right at Leighfield who did enough to smother the rebound. The home side did threaten again in 22 minutes. 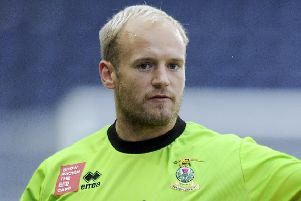 Mark Reynolds planted a header from Stanton’s in-swinging corner, but he saw his effort nodded off the line by Queens’ full-back Scott Mercer. 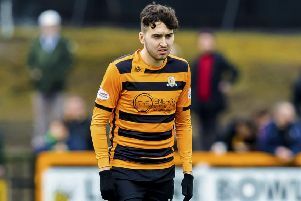 With Alloa leading County at half-time, United had every incentive to capitalise but it was their opponents who struck seven minutes into the second-half. A neat one-two involving Dykes and Dobbie resulted in the latter being barged in the back by Stanton and a penalty for the visitors. Up stepped Dobbie to send Siegrist the wrong way from the spot for his 39th goal of the season. Queens went further ahead in 58 minutes. Dobbie’s neat flick was perfect for Dykes to run onto and he calmly poked a shot through the legs of Siegrist from eight yards. United threw themselves a lifeline when Clark rose to guide his header from substitute Peter Pawlett’s cross high into the top corner, but Queens held on.